I met Peggy Crome about 15 years ago, when I was a keen triathlete. We were on a Robin Brew swimming course in Devon. I didn't know how old she was, but I she was a vet (!) and I had a lot of admiration for her, as even then she had quite a lot of triathlons under her belt - more than I could imagine doing! All those years later she has gone on and taken part in even more racing, representing Britain at the age-group worlds, and also doing Ironman triathlons. She may be coming to a triathlon near you! I only got into cycling because it was a triathlon discipline. I had cycled as a kid, though we had very old rickety-rackety bikes at home on the farm. Those bikes had no brakes and we used to put our feet up on to the back wheel to stop!! Riding around was okay in my childhood as there was hardly any traffic where we lived. Then I left cycling behind till I was about 40 years old when I started triathlons. I rate cycling second out of the three disciplines, as I came into triathlon from running and that’s what I do best at. I do love the speed you can get with cycling around though. It’s far more physical than standing around waiting for buses and trains! My first experience of being on a road bike was when I borrowed a bike from one of my sons. I found it quite scary. Then I had a bit of a nasty experience, with an impatient lorry driver behind me. I thought I had stopped to let him go by, but I hadn't quite stopped. I found myself looking up under the lorry - lucky for me I JUST escaped, and the lorry carried on without stopping. My heart was racing! Thankfully nothing like that has happened since. I have my own bike now, a Specialized Shiv, and it’s quite good. As I have got older, I have had more money to spend, and we old folks need every bit of help we can get from technology to go faster! Since 2003, I have qualified for 23 age group multisport championships, and have had 19 podium finishes, including nine wins. My golds were at the European Triathlon Championships in Kitzbuhel, Austria (2014), Athlone, Ireland, (2010); at the World Championships in London - Aquathlon (2013), Eilat, Israel - Triathlon (2012), Gold Coast, Australia (Aquathlon and Triathlon) (2009), Vancouver, Canada -Triathlon (2008), Queenstown, New Zealand - Triathlon (2003). I also won gold in the Powerman Long Distance Duathlon (10k-60k 10k run) in Copenhagen, Denmark last year, and bronze at the 70.3 Ironman in Zel am See, Austria, in 2015. As I get older I find I have to work harder to stay fitter and free from illness! I think the worst thing about getting older is that you have to accept slower times and that you are not going to do any more all-time PBs [personal bests]. I get around this problem by setting new targets on January 1st each year. My goal this year is to compete in the World Age-Group champioinships in Rotterdam in September. I doubt that I will do really well there, because I will be the oldest in my age group. But I hope to do well enough to qualify for next year's championships in Australia. When it comes to bike courses I say the hillier the better! Although I hate hills, Devon is quite hilly and I find that I have an advantage over those who don’t have hills near where they live. During the bike leg I never get tempted to draft, as I am rubbish at drafting. I like to see where I am going and can never trust the rider in front not to stop suddenly. When do the 112-bike ride during an Ironman I make use of the three positions you can get into with tri-bars - hands on the bars, on the hubs and on the drops. I keep changing hand position and shuffle my bottom around to keep comfortable. If the course is flat, I change up a gear and stand on the pedals - this helps to stretch the legs out. I train a fair bit on the bike but I don’t do a lot of cycling outside of training. However, right now my campervan is in the garage for major repairs, so it is good that I can still travel around on my old bike. I do take part in local 10-mile and 25-mile time trials as I find cycling in races with the 'purists' helps to keep me focused, and stops me thinking about putting the rubbish out or what I am going to have for tea! Last year I did cycle from John O'Groats to Land's End with my granddaughter. I was 73 years old, and she was 13! That was quite a fun trip. When I go out riding I never go out without my helmet. It’s the most important thing for me. I also take a stopwatch – no Garmin as I’m not a tecky person! I use a turbo trainer for when the weather is really bad - like icy, though I try to do as much outdoor cycling as possible. It is good to experience different weather conditions on the bike because you never know what the heavens are going to throw at you on race day. I find that in my age group, although the number of people racing is fewer the people that take part are very, very serious, especially the Americans. Also, because they are, mostly, retired they have more time to follow their schedules and most importantly, more time to rest and recover. I mainly do Ironman 70.3 races [1.2-mile swim; 56-mile bike; 21.1-mile run) rather full Ironman races [2.4-mile swim; 112-mile bike; 26.2-mile run]. My family used to be amazed at what I was doing, but now they are used to it and I can no longer 'wow' them. Friends, however, often say, "I want to be like Peggy when I grow up! "...even though they are in their 40s, 50s and 60s! I have had a few tricky situations to deal with in triathlons. Once, I had a bad crash on the bike leg during a race in Cleveland, America. However I was able to recover and straighten the handlebars of my bike and after checking my major bones I found the adrenaline kept me going. The day after I discovered I had 14 major bruises on my body and a broken wrist bone! 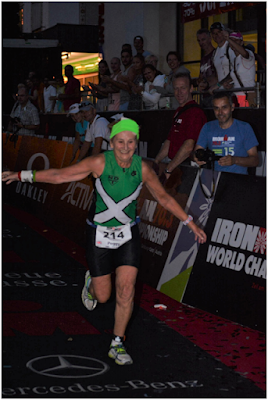 My toughest race was The World Ironman 70.3 finals at Zell am See-Kaprun, Austria. I like hilly bike courses but this was mad!! There was a 10-mile climb followed by a one-and-a-half-mile 20% gradient at the top of the mountain. My reward was third prize at the end when a couple of others in my age group didn't make the cut off times. My favourite race in the UK has to be the Ellesmere triathlon in Shropshire – at least once I’ve waded through the duck and goose poo that squelches up between your toes at the start of the lake swim! The rest of the course is good! The most interesting person I’ve met in triathlon is Tim Don. He has always been very helpful to us age groupers. I remember him advising us how to push a bike up a steep cobbled road once, and telling us how to take advantage of leaning on the bike as well as pushing it. I had the privilege of sharing a taxi with him from Munich airport to Zell am See. 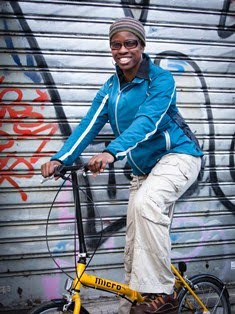 I also find Chrissie Wellington a very interesting person. She came down to meet the North Devon Triathlon Club and did a Park Run in Barnstaple with us, then followed us up to Woolacombe Bay for a sea swim. She was really helpful with the triathletes who were apprehensive about sea swimming. Triathlon has led me to do a lot of travelling. I have been to New Zealand twice, Australia twice, Beijing, Honolulu, America and lots of other places. I always travel with NIRVANA UK. Although it might work out a little more expensive than travelling independently, it is well worth the extra. All I have to do is put most of my stuff in a bike box and case and get to the nearest airport. For all the travelling I do, my favourite place to ride is along the Tarka Trail, in North Devon, which I would ride more if I wasn’t racing or training. 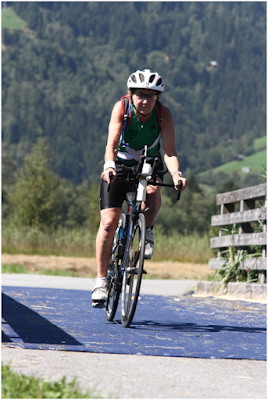 My advice to older people who may wish to do endurance sports is to just have a go. Train to cover the distance. Only ever compete against yourself and your own times. It’s best to do an event for your favourite charity first, then the only pressure is to finish the event. The next step is to do it again...quicker! For me, cycling means three things – freedom; speed; friendship. Biking, running and swimming too!